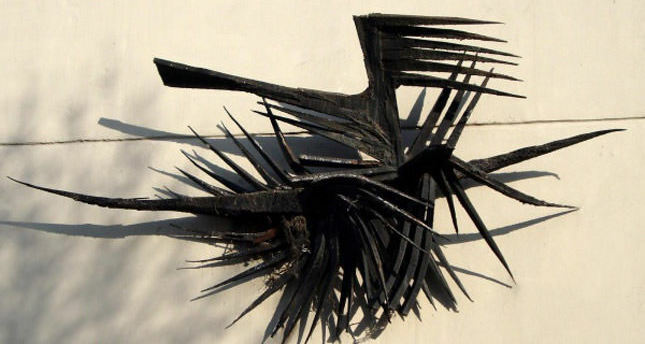 The sculpture "Soyut Kompozisyon" (Abstract Composition), also known as "Kuşlar" (Birds), which was completed by sculptor Kuzgun Acar in 1967 is being restored by the Cultural Awareness Foundation. The sculpture, which had been hanging outside the Istanbul Manifaturacılar Çarşısı (Istanbul Drapers Bazaar) since 1967, has suffered due to weather conditions over the years and some parts of it have started to fall off. The Culture Awareness Foundation undertook the cleaning and maintenance works of the wall mosaics inside the bazaar and prepared information plaques for artworks and their artists in 2008. The foundation joined forces with the management of the bazaar and Fatih Municipality in 2013 in order to restore and conserve the famous "Birds" sculpture located outside the building. In the very beginning of the restoration, it was found that Acar's sculpture was more damaged than it was previously thought. The location where the sculpture had stood is now covered with a poster stating that the artwork is currently under restoration by the Culture Awareness Foundation, Fatih Municipality and the management of the bazaar. The restoration works, which are overseen by the Project, Science and Advisory Committee, as well as individuals who care about art, culture and urban texture, continue at Özer Aktimur's workshop located in Seyrantepe, Istanbul. According to the restoration report prepared by Aktimur, the sculpture features two different levels of damage. While some parts of the sculpture that are in relatively good condition compared to others can be cleaned with mechanical devices, highly damaged parts can only be cleaned with chemical components and techniques. While the sculpture will be delivered to the management of the bazaar once the restoration works are completed, the management is currently working on finding a better way to exhibit and conserve the artwork. The "Birds" sculpture, which will return to its former condition thanks to the recommendations of the Project, Science and Advisory Committee and the contributions of the management of the bazaar, will soon be returned to its original location. Moreover, the Culture Awareness Foundation plans a series of events and organizations following the delivery of the sculpture to its rightful owners. A panel session will be held in order to raise awareness about the artwork and its artists among the public, as well as about protecting works of art and the techniques that are used to conserve them. During the panel session that will stress the importance of art in urban life, Kuzgun Acar's students and experts in the field will come together. Additionally, a theatrical performance that will refer to the other works of Acar will accompany the panel session.